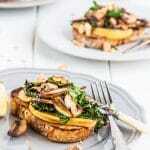 These scrumptious brunch toasts are topped with earthy mushrooms and slightly bitter cavolo nero which contrast beautifully with sweet pear and leeks. The finishing touch is a sprinkling of toasted walnuts. Begin by toasting the walnuts. Place a large frying pan over a low heat and toast until lightly golden and fragrant. Place in a small dish to cool. Return the pan to the heat and increase to a medium low heat. Brush each slice of sourdough with olive oil and toast until golden. I find using a fish slice helpful to push down the bread so that the whole slice toasts evenly, otherwise I find the crust tends to toast much quicker than the center. Flip the bread and toast on the other side before placing on a plate. Increase the heat to medium low, add the pear slices to the pan, cooking on each side for 2 to 3 minutes until lightly golden. Trim the tender leaves from the cavolo nero and chop the stalks. Add 2 tbs olive oil to the pan and add the leek and cavolo nero stalks. Cook until the leeks are soft and the stalks are tender. Add the leaves and cook until they start to soften (they will turn bright green at this point) and add the lemon juice. Season with salt and pepper and remove from the pan and place in a bowl and keep warm. Crank the heat up to high and add 1 tbs olive oil. Add 1/3 of the mushrooms, making sure that they are not overlapping in the pan, and leave for 1 to 2 minutes before stirring. The mushrooms should be lightly golden. Cook for a further minute before removing from the pan and placing in the bowl along with the leeks and cavolo nero and repeating with the second batch. Assemble the toasts by topping the toast with slices of pear. Toss the mushrooms, leeks and cavolo nero and season to taste. Divide between the 8 slices of toast. Top with the toasted walnuts and a drizzle of extra virgin olive oil. It's important to use a pear here that is ripe, but not overly so, otherwise they will fall apart when cooked. If you can't get your hands on cavolo nero substitute with kale, baby spinach or rocket (arugula).